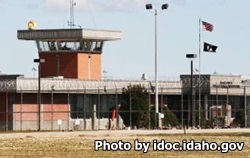 Idaho State Correctional Institution is located in Kuna Idaho. It is the oldest and one of the largest correctional facilities in the state, with the ability to house 1688 adult male offenders. Most of the inmates at this institution are long term medium custody inmates, but the facility also has an infirmary and houses geriatric offenders. This prison also has an outpatient mental health program for those inmates who require metal health treatment. One of the unique things about Idaho State Correctional Institution is the double razor wire fences that have dogs patrolling as sentries in between. If the dogs don't deter escape attempts, the seven towers with armed guards will. Inmates can spend their incarceration time learning new skills within the correctional industries, get an education that includes earning a GED and can attend religious services held through the chapel. You may only visit an inmate after your visitors application has been approved. You must arrive 45 minutes prior to the visiting time to be processed into visitation, if you do not arrive early you will not be allowed to visit. Visiting days and times will depend on the unit your inmate is in, the visiting hours rotate every few months so you should contact the facility to verify these visiting times. Thursdays from 10:15am-12:30pm, 1:45pm-4pm, 5:30pm-7:45pm. Fridays from 10:15am-12:30pm, 1:45pm-4pm, 5:30pm-7:45pm. Sundays 9am-11:15am, 12:15pm-2:30pm, and 3:30pm-5:45pm.